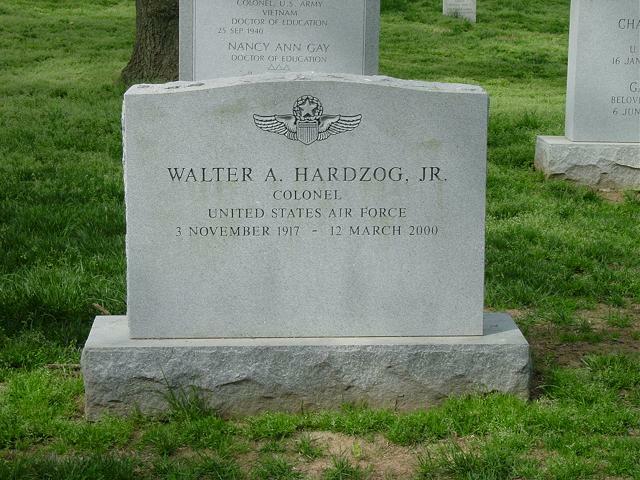 Walter A. Hardzog Jr., 82, an Air Force pilot and former lawyer who was also business manager for 10 years at Churchill High School, died of congestive heart failure March 12, 2000 at ManorCare nursing home in Potomac, Maryland. He lived in Chevy Chase. Colonel Hardzog retired 30 years ago from Air Force headquarters, after a posting to Norway as assistant chief of staff for Allied forces in Northern Europe. He had also flown bombers and refueling planes during the Vietnam War. He began his military career in the Army Air Corps in 1941 and went on to fly 50 missions as a B-25 flight leader in Europe and Africa during World War II. He was featured in a Saturday Evening Post article about the heroics of a bombing crew and was sent on War Bond drive tours as a decorated hero. His military honors included 11 Air Medals, the Air Defense Medal and the Distinguished Flying Cross. Colonel Hardzog was a graduate of the University of Alabama and its law school. He also studied law at George Washington University. He left the military and practiced law in his hometown, Ozark, Alabama, and then was recalled to duty in the Air Force. He spent much of his military career as an operations and planning officer in the Strategic Air Command, in posts that included England. He worked for the Montgomery County Schools until 1981. He was a member of Lakewood Country Club. Survivors include his wife of 55 years, Sarah Croom Hardzog of Chevy Chase; three sons, Walter A. Hardzog III of Nevada City, Calif., Robert Hardzog of Potomac and Bruce Hardzog of Rockville; and five grandchildren.